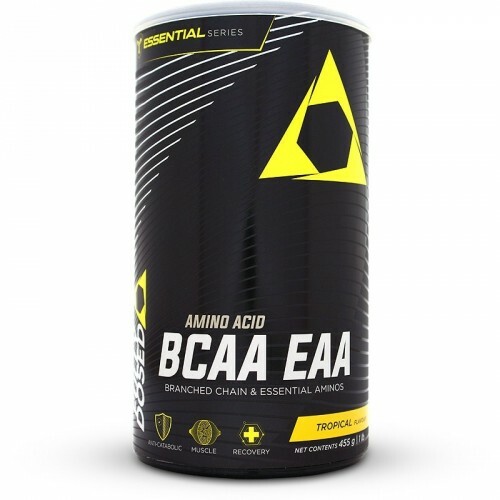 Fully Dosed Amino Acid BCAA EAA enhances training recovery and increases lean muscle by improving protein synthesis. Essential Amino Acids (EAA) are amino acids that your body cannot produce, so it’s vital that they be consumed through your diet. Amino acids are found in protein-rich foods such as meat and dairy. Athletes not consuming enough of these foods or eating a plant-based diet may not be getting enough of these important amino acids for their fitness goals. Increase muscle by improving protein synthesis, a process which makes your body more efficient at using the protein you consume from shakes and whole foods. L-Leucine is the amino acid responsible for increased protein synthesis. Each serving provides the full recommended dose of 4 grams L-Leucine to ignite your gains. When amino acids are taken before, during or after your workout they help with muscle recovery by providing the building blocks needed for repair and thus faster recovery. BCAAs contained in EAAs reduce the risk of muscle breakdown during intense training. Important for athletes training first thing in the morning. Studies suggest that for BCAAs to be properly absorbed by the body they need to be consumed together with other Essential Amino Acids (EAAs). This is one of the few locally produced products that combine BCAAs and EAAs for optimal training performance. To help combat training-induced free radical damage, 250 mg of Vitamin C has been added to this product. Making this one of the most comprehensive BCAA formulas currently on the market. Highly Branched Cyclic Dextrin (HBCD), Malic Acid, Flavour, Citric Acid, Ascorbic Acid (Vitamin C), Sucralose, Colour. • For one serving mix 1 rounded scoop (approx. 15 grams) into 250 to 300 ml cold water and shake or stir vigorously to dissolve. • Drink 1 serving whilst training and for optimal results consider taking an additional 1 to 2 servings before or after workouts. • Consume one to three times daily. Seek advice from a health care professional before use if you have any pre-existing condition. Not to be taken by pregnant or nursing women or children. Discontinue use and consult your doctor if any adverse reactions occur. The product taste terrible. I bought it three weeks ago and only used it twice. I can't comment on the effectiveness. There must be something you can add to make it more tasteful. I can only stomach this if I mix it with preworkout and another BCAA. The taste is really disgusting.